The CarterFuel Systems program features unique innovation and solutions by offering premium OE fit, form and function as well as exceptional vehicle coverage and exclusive problem-solving features. Carter Fuel Systems Rotary Vane style pumps for Carbureted and Diesel applications, were originally created for Military use and are appropriate for RV, Marine, AG, industrial and Performance applications. Some characteristics include: operating using leaded and unleaded gas, diesel fuels, and fuel boosters; free-flow fuel delivery; internal pressure regulating valve, filter required. Features constant flow, non-pulsating pump. 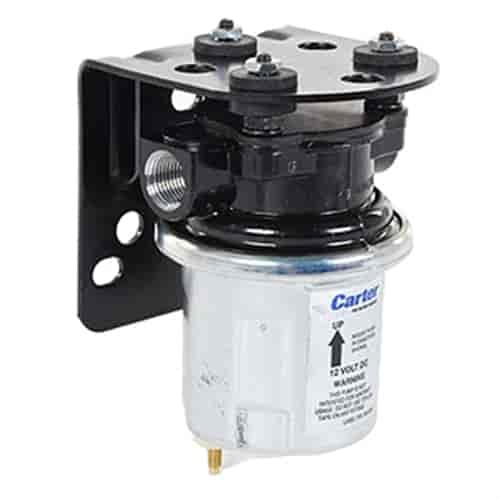 Carter Competition Series Electric Fuel Pumps are designed and engineered for constant use, hi-performance, and quiet operation. These positive displacement pumps are unique in that fuel cools the motor, no points to burn out, no shaft seals subject to deterioration and leakage, ''free flow'' constant fuel flow, fuel intake strainer. Many models are designed to fit your specific needs and power requirements, all mounting hardware and bracket included. They are engineered to operate with leaded, unleaded, gasohol, fuel additives, and race gas. Pumps are designed for carburetor engines and to operate in pairs when needed to meet your MEGA HP requirements for Street, Strip and Off Road Vehicles! P4600HP is rated 4.4 out of 5 by 9. Rated 5 out of 5 by Man111 from Seems to be doing well. Installed a month ago a little loud but pumps the fuel. Rated 5 out of 5 by goalaska from good quality and super quiet This is the quietest electric pump that i have ever used. i put extra rubber washers with longer screws on the frame mount side. Works fantastic. a BIG thumbs up as with all of Jegs products. Rated 5 out of 5 by Greasey Rider from The title says it is better than average. This pump finally is doing just what I want a lift pump to do on my 12 V Cummings. Rated 5 out of 5 by Cheto from Great product! I bought this about two weeks ago I'd never thought I'd need an electric pump for classic,l'm glad I got this one it works great! Rated 5 out of 5 by shorinji65 from I bought this pump to update and improve the performance of my Nova, and it does perform as it said it would. Rated 5 out of 5 by Montecarloman from Works great. I was already using a Carter fuel pump, so I decided to stick with brand. It came with everything I needed to install it and went in with ease. Rated 1 out of 5 by Transamdj from Did not perform as advertised. I recently purchased this pump to retrofit a 1978 Transam carburated fuel system. It was only capable of pressuring to 4 psi and was ectremely noisy. Should this pump hold pressure at the carburator after the motor is shut down. Is there a check valve in the pump assembly. No, this will not hold pressure as there is no check valve in the pump. Yes, this should support your drag car. No the output pressure on this is not adjustable. I have a 1979 Winnebago Brave with a Dodge 360. Will this pump be a suitable substitute for the mechanical fuel pump? Thanks. Yes, this pump will work well in your Motorhome. Is this gasohol compatiable? E85 compatiable? Yes, this pump will work with E85. Can you use this pump on 1993 chevy turbo diesel instead of the rail lift pump? Yes, this can be used as a lift pump in a diesel application. Yes, as long as the pump is mounted at or below the level of the top of the tank. THis would be a replacement lift pump only for the diesel engine and would go in place of your current lift pump. You engine has a high pressure pump for the diesel injectors. JEGS 15003 - Billet Fuel Filter Mount Inner Diameter: 1-3/4"